Tools Plus has a wide variety of drywall tools that will help you with any interior wall or ceiling finishing project. A drywall hatchet makes it easy to drive nails into sheetrock to hang it, because of its specially designed head that grips the nail. Jab saws and the cutting end of the drywall hatchet make easy work of creating holes for outlets and other purposes. Then the putty knives will evenly spread spackle to cover up the nails and other imperfections in the drywall. 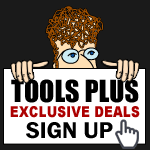 Drywall Tools are just one of the many categories of Hand Tools offered at Tools-Plus.com. Curved radius blade sized to bucket for easy removal of material. Aluminum, lightweight hooks to your belt to hold pan anywhere you go! Kraft Tool DW728PF Putty & Drywall Knife Stainless Steel 2"
Kraft Tool DW729PF Putty & Drywall Knife Stainless Steel 4"
Kraft Tool DW730PF Putty & Drywall Knife Stainless Steel 5"
Kraft Tool DW733PF Putty & Drywall Knife Stainless Steel 6"